SH.MAMEDYAROV: I have been thinking yesterday how I had to play today. It was a hard moment for me as long as I always play active chess, while I didn't know what to do today. I didn't feel like playing nicely and having a worse position. Actually, I could, but the result was important today. I played almost the entire tournament being a bit sick, so it was still hard for me. So, I thought that I shouldn't spoil a good performance in the tournament with only one game. I decided to play secure chess and I did it. It's true that Leko also didn't want to risk. A situation much like this happened to me two years ago in Tal Memorial: I was leading and I had to play against Gelfand in the last round. At some point I saw the way to draw, but I also noticed a risky move, which I thought would give me an advantage. I lost the game and instead of winning the tournament, I just shared 1-3 places. It was really upsetting. So, today I thought that it is better to share the first place than to lose the last game and go home empty-handed. М.YURENOK: Sure. You just sad you were a bit sick. How did you recover after losing? What helped you to have such great performance in the second part of the competition? SH.MAMEDYAROV: I was lucky because right after I lost, my manager and good friend arrived here. A new person, it's interesting with him, we relaxed, visited some places. 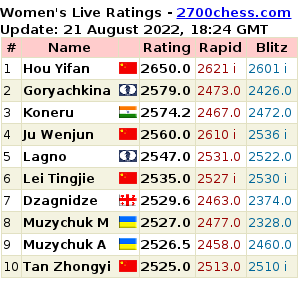 I understood that this is a long tournament, the participants are playing approximately at the same level, anyone can lose against anyone and not even once. I lost against Grischuk a "normal" game, not an upsetting one. So, I thought that nothing crucial has happened and started to play as if I was playing a new tournament. Then I again played a calm game against Gelfand and after a rest day I realized that I had to start playing risky. SH.MAMEDYAROV: A young man Rustam. We work together for 4 years already, but he's just my manager, not my coach. What is more important - he's my friend. I feel better when he attends the competitions I'm playing at. М.YURENOK: Who's your coach then? Do you continue working with Elizbar Ubilava? SH.MAMEDYAROV: Of course I continue working with him too. There also are some other people helping me. М.YURENOK: I guess you don't want to tell more about them. Do you hope for the overall first place in the Grand Prix Series? SH.MAMEDYAROV: Well, it's hard to tell anything beforehand, because I lost a lot of rating points. So, when I finally got the chance, I understood that I have to use it and fight for the first places. Each year it becomes harder and harder to play, so it's a right moment to use my chance, enter the Candidates tournament and again try to fight for the title. М.YURENOK: Which is your next tournament? SH.MAMEDYAROV: The European Club Cup, which starts in a week. М.YURENOK: And you probably hope to take first with your team? SH.MAMEDYAROV: Of course, we have a very strong club. I will probably be on the 5th board because of my ELO. М.YURENOK: Anyways, you have gained a lot of ELO points recently! SH.MAMEDYAROV: Yes, I did so in the last two competitions. М.YURENOK: What is the reason? Why have you started playing so good? 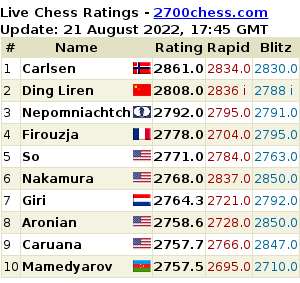 SH.MAMEDYAROV: Actually, my rating usually stayed at 2750-2760 mark in recent years. However, I had a very unsuccessful tournament n Bulgaria and lost 30 points. Now I managed to show a good performance in two competitions. М.YURENOK: I just thought maybe there's some special reason for that? For instance, Teimour Radjabov started playing even stronger after he got married. SH.MAMEDYAROV: I don't want to say anything regarding this topic now, but everything will be OK.
М.YURENOK: I wish you all the best. How do you like in London? Is it your first time here? SH.MAMEDYAROV: No, this is my second time here, however, it's for the first time I'm playing in a tournament in London. I have visited London when my manager was living here. SH.MAMEDYAROV: Not really, I managed to do a lot of things here. М.YURENOK: So, what places have you visited? SH.MAMEDYAROV: I would say I had a good rest and a good tournament. I wasn't sitting in the hotel all the time. I wasn't bored. I had fun. М.YURENOK: Thank you very much.